Our highly experienced resident cooks cater for all dietary requirements. Our meals and snacks are carefully planned, well balanced and prepared on the premises using fresh produce from local suppliers. All children are offered at least 5 portions of fresh fruit and vegetables a day. Meal times an opportunity to encourage your child to eat a wide range of foods in a relaxed atmosphere with their regular carers. Our menus are always on display, regularly reviewed and we encourage children and parents to make suggestions for all. We often have celebration food linked to various festivals to try and your child will learn many social skills at the dinner table. A light snack is served mid morning and mid afternoon with water or milk. A hot two course meal is provided at lunch time and a variety of hot/cold tea time meals are served in the afternoon. Babies are fed with milk their parents provide. When they are ready for solid food we purée freshly prepared food from our kitchen and as your child develops we gradually introduce a few lumps into their meals as per your guidelines. Fresh water is available and offered to all children throughout the day. To encourage independence the older children can help themselves to water when they wish from their named cups and bottles. The Hedgehogs have a ‘cafe’ system for their snack whereby they pour their drink, sit and eat their snack when they wish. Eating healthy food will give your child more energy to do the things they love for longer; it will also help with their concentration. We involve our cook in some of our food activities and try to educate your child as to where the food they eat actually comes from. Your child may grow their own seasonal fruit and vegetables in the nursery garden, which will make mealtimes so much more interesting! All of our nurseries have been awarded a category 5 star rating following a recent “Rate my Place” food hygiene inspection by Local Authorities. 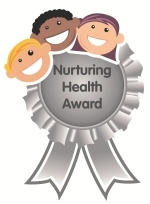 Our Stafford Nursery has also been awarded the Platinum Nurturing Health Award 2015, an award which recognises that Honeybuns provides excellence in the provision of nutrition, physical activity, health policy development; health related learning activities, partnership with families and staff involvement.